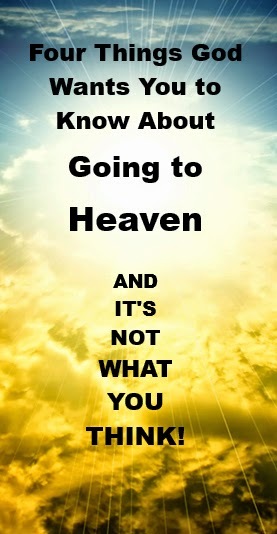 Click here to download Four Things God Wants You to Know About Going to Heaven. Click here to download Cardinal Bellarmine. Merit And What God Did About It. ① We are disqualified from going to heaven on our own merit because we all have missed the mark. Romans 3:23 says, "For all have sinned, and come short of the glory of God." The words come short mean to “miss the mark." It doesn't matter how close or far away from the bulls-eye you hit—a miss is a miss, and Scripture declares that we have all missed. A friend and I were "siting in" my 12-guage shot gun. I bragged that I only missed the bulls-eye by a half-inch and he missed it by five inches. The fact was, we both missed. In the spiritual realm, coming close doesn't count. ② God wants us to know that our sin is extremely grave and deserves eternal punishment. I have a friend who was an officer in the army. He was washing up in a restroom at his base when five private first class soldiers began to make fun of him because of his small stature. My friend picked up his coat from a nearby chair and put it on. When they saw that they were insulting an officer, they each stood at attention, saluted my friend, and apologized. Many people think that sin is no big thing. Some think it's a joke. If you believe the above, you don't know who you have sinned against. Jesus Christ's office and divinity is worthy of your highest respect. He is the Supreme Commander of the entire Universe. Everyone will bow their knee in recognition of this fact at the judgment. The Punishment For Sin Is Awesome! Matthew 25:41 describes the sinner’s fate as “into everlasting punishment." That's forever! Revelation 14:11 declares, "And the smoke of their torment ascendeth up for ever and ever." Even what people think are insignificant slips of the tongue or idle gossip will receive the full force of judgment in Gehenna. Note what Matthew 12:36 says. "But I say unto you, That every idle word that men shall speak, they shall give account thereof in the day of judgment." No one will have religions’ trump cards to veto their sin and save them on the Day of Judgment. All our sin carries an eternal punishment. The only hope is for someone perfect to take care of our eternal debt of punishment that we owe for our sin. Yet God’s holy character, at the same time, must not be violated. He cannot change His moral and spiritual nature. He is holy. But, within His holiness, there is good news. He does have a way out for the whole human race. ③ God wants you to know that Christ paid your sin debt. The Bible says in 1 Peter 2:24, speaking of Christ, "who Himself bore our sins in His own body on the tree." The birth, death, and resurrection of Christ are the three greatest events in human history. Christ took care of our sin and paid the eternal debt of punishment that we owe by dying on the cross. We cannot pay it unless we go to Hell forever. The resurrection is God the Father’s “AMEN” that He accepted the work of Christ for our sins. Let's suppose you get a $500 traffic ticket but don't have a dime to pay the fine. A loving compassionate person finds out and goes to court with you. The judge, after hearing testimony, says, "That will be $500, please." The loving person steps up, pulls out his wallet, and says, "I'll pay your debt." At this point you have a choice. You can accept the money offered or you will have to pay it. If you pay your sin debt, it means punishment forever for every sin. If you receive Christ's payment, you are forgiven and freed from your debt for all eternity. ④ Finally, God wants you to know how to apply Christ's redemptive work to your life. In Acts 20:21 it says, "Testifying both to the Jews; and also to the Greeks, repentance toward God, and faith toward our Lord Jesus Christ." Scripture says in John 1:12, "But as many as received him, to them gave he power to become the sons of God, even to them that believe on his name." In my early religious life, I was deceived. I believed that my church and religion could save me from the debt of punishment I owe for my sin. A simple reading of Scripture showed me that the Lord Jesus Christ is the Savior—not any church or religion. He is your only hope of heaven. Embodied in my prayer of salvation on July 4, 1969 was the desire to forsake sin and reject the belief that my church and religion could get me to heaven. I then received Christ alone as my soul's salvation. If you really want your sins to be forgiven by receiving Christ, first read the following prayer to know what you are praying, then pray it sincerely. "Lord Jesus, I’m a sinner and I need a Savior. Forgive me for my sin. As best as I know how, right now, I turn from my sin and I receive you as my Lord and Savior. Thank you for dying on the cross in my place." If you have prayed this prayer and trusted the Lord Jesus Christ to forgive you for your sin and make you his child, I encourage you to go to my website at www.visitnormsplace.net and click on the words Bible Studies found toward the top of the Home Page. These Bible studies are offered to aid you as you begin to grow in the knowledge of the Lord Jesus Christ. Many believe Robert Cardinal Bellarmine (1542-1621) was the best of all the Jesuit theologians. He was declared a Doctor of the Roman Catholic faith in 1931. In this article, I do not want to misrepresent him for he was a dedicated Roman Catholic to the day he died. Bellarmine made some strong statements about the doctrines of Intention and Good Works. On July the 4th in 1969, I was employed as a religion teacher at a catholic high school in Michigan. On that day, I transferred my faith from religious teaching and works, that I could never be assured would get me to heaven, and placed my faith exclusively and completely in Jesus Christ alone as my Savior and only hope of Heaven. I trusted in the blood and merits of Jesus Christ alone. Our sin is extremely grave and deserves an eternal punishment. uI have a friend who was an officer in the army. He was washing up in a restroom at his base when five private first class soldiers began to make fun of him because of his small stature. My friend picked up his coat from a nearby chair and put it on. When they saw that they were insulting an officer, they each stood at attention, saluted my friend, and apologized. (See also Matthew 3:12; 13:41-42; Mark 9:48; Luke 16:23-24) Good works on our part will not eliminate the fact of eternal punishment. Jesus, the eternal Son of God, paid for our sins on the cross. Isaiah 53:6 says, “…and the Lord hath laid on Him the iniquity of us all.” 1 Peter 2:24 says "who Himself bore our sins in His own body on the tree." On the cross He said, “It is finished,” and died. (John 19:30) Scripture declares this sacrifice complete and never to be repeated again. The battle to get us to heaven was Christ’s. It’s not ours and it’s not religion’s battle either! You and I and the church throughout history cannot add anything to or take anything from the victory of Jesus’ death on the cross. Our faith in Christ and His great victory on the cross allows us entrance into heaven. He became our sin and paid our sin debt in full—the eternal debt of punish-ment we all owe a righteous eternal God for our sins. Trust in the death of Christ on the cross for your sins. You have no hope in human religious inventions presented by fallible men of whose teachings and intentions you could never be certain! But you can be certain of Christ’s infallible work on the cross that was recorded in the Bible. First Peter 2:24 says, “who himself bore our sins in his own body on the tree.” That was all the sins you committed in the past, present, and future. He paid it all. Receive Christ now. Would you read and then sincerely pray the following? I will send you free Bible studies to help you grow in your Christian faith.